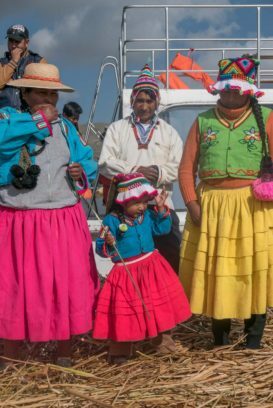 When asked why they wear such bright colours the women of the Uros Islands on Lake Titicaca replied “We are the flowers of the island, the men are the cactus”. It’s an apt analogy. The women do indeed look like flowers dressed as they are in brightly coloured long skirts and shirts. And their smiles are just as bright as they welcome us to their village to learn about their way of life. 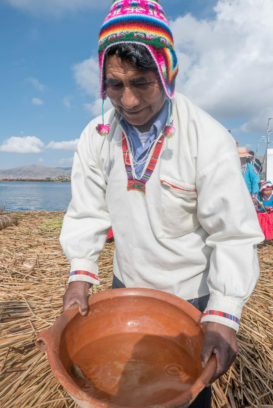 About 3000 people live on the series of islands that make up Uros. The islands have been around since about 500 BC. They are made – yes made – by the inhabitants using local reed. 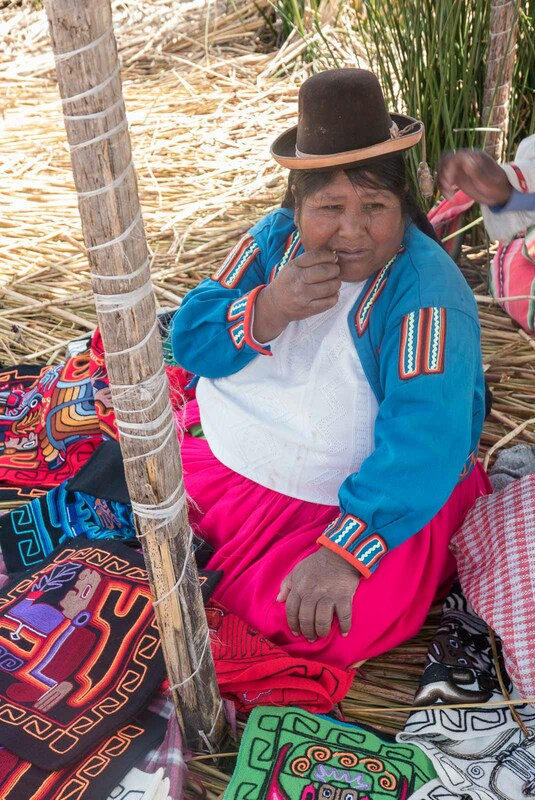 Our guide, John, tells us that in years past the inhabitants regularly lived to 100 – the oldest was 124. That was before they began buying the kinds of foods we eat in western societies. Back when they existed on what they could farm themselves or catch in the lake. Corinna, showing us her house. It is still a very simple existence. 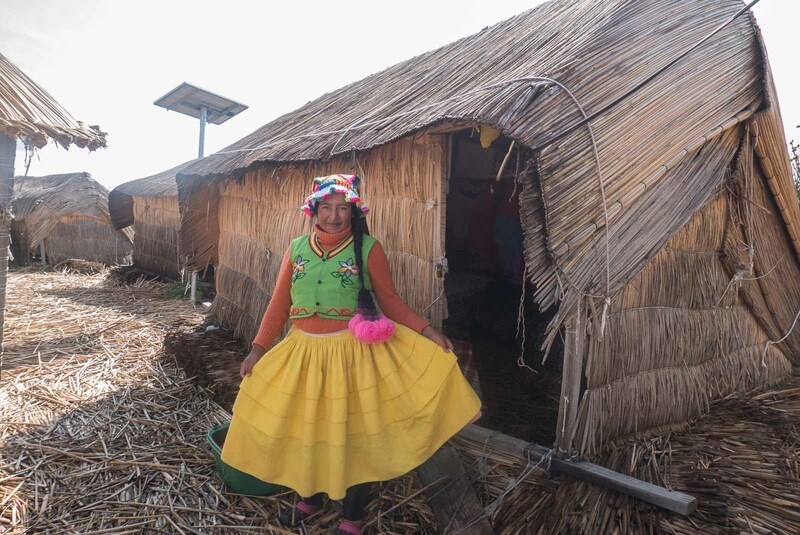 The inhabitants of the village we visit use solar energy and still farm or catch much of their food. Through our guide, and some very energetic charading from the local men, we learn that the islands are rebuilt every month by piling reeds on top of each other. Fights between neighbours are easily settled here. They simply saw through the island, undo the anchor and separate the land – no courts, or lawyers involved! After the ‘floorshow’, we are invited inside the huts to see where the women sleep. Fifteen-year-old Corinna approaches me shyly, asking if I would like to see inside her room. Of course I would! The pride in her eyes is obvious as we enter. She points out her prized possessions, her many beautiful skirts, her small reed boats and mobiles, but my attention is immediately drawn to the TV. Even here! It’s a very small box television, black and white, and her smile grows that bit wider when she sees me looking at it. She gives me a knowing look, as though I’ve just been let in on a secret. They use the reeds here to build just about everything and after a spot of shopping – there’s always a market – we all load on to a Balsa (reed boat) and tour the islands for an hour. I nestle into one of the hulls and stare up at the lookout on top, taking in the waterside activity – and the other tourist boats. The cruise was over far too soon but there was more to see on Lake Titicaca and so we made our way to Taquile Island for lunch. Where Uros was man-made and all brightly coloured, Taquile is a natural island, mountainous and all earthy colours. After a lunch overlooking the clear turquoise waters we take a slow, steady walk up to the centre of the island. The steep rocky path and ocean-like backdrop immediately bring to mind the Greek islands. 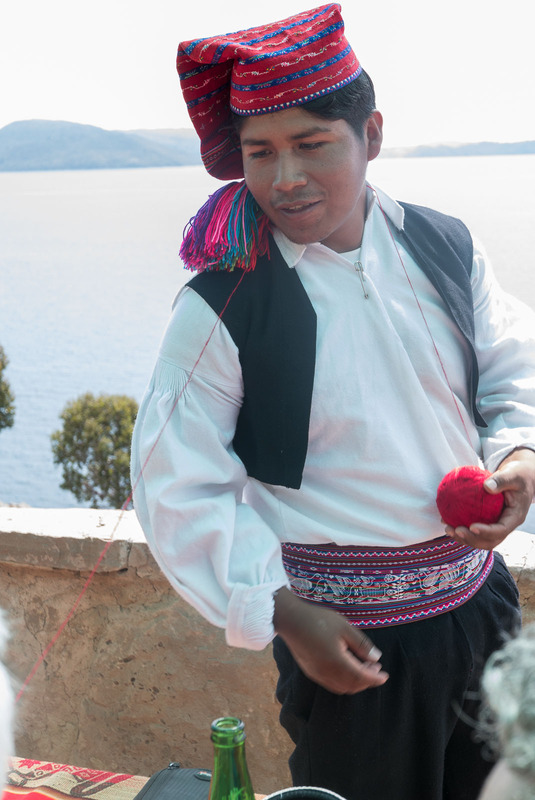 The island is beautiful in itself, but it has one very distinct feature – the knitting. Here, the knitting is done by the men – the women don’t knit at all. The men don’t knit to sell, they knit for themselves and their families and friends. It’s one of the few small towns I’ve come across travelling that actually doesn’t have a market – at least if it does, we don’t get to see it! The expert ‘knitters’ of the island. It’s not all earthy colours on Taquile Island. We follow a little old lady herding her goats down the main path and stop to photograph two woman in traditional dress resting next to a beautiful old archway. Uros and Taquile were completely different, both lovely in their own way. And it’s interesting that the communities on islands, geographically so close together can be so different. 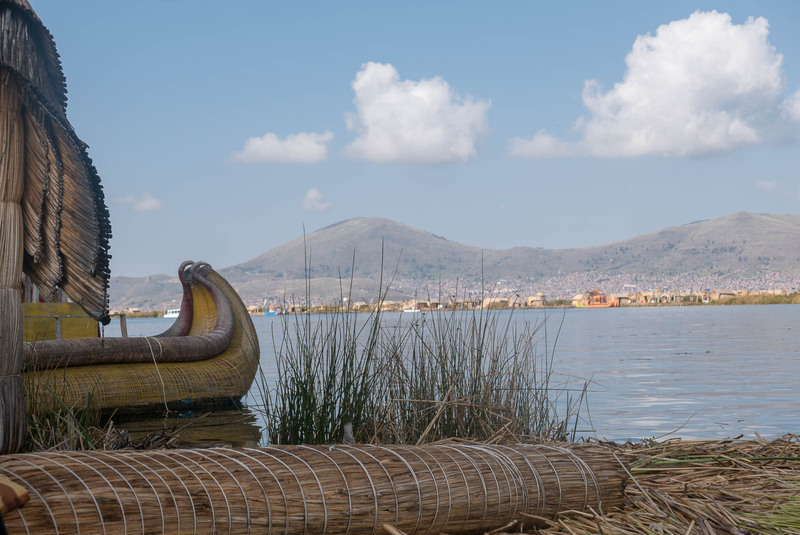 Lake Titicaca is the 18th largest lake in the world and at more than 200 metres deep, one of the deepest. Nestled into the Andes Mountains, it is said to be one of the highest navigable lakes in the world at 3812 metres. It is a fresh water lake, which at one time was full of fish – more than 40 species. But trout and kingfish introduced to the lake brought various diseases and the fish life is now heavily depleted, severely impacting the local food source. 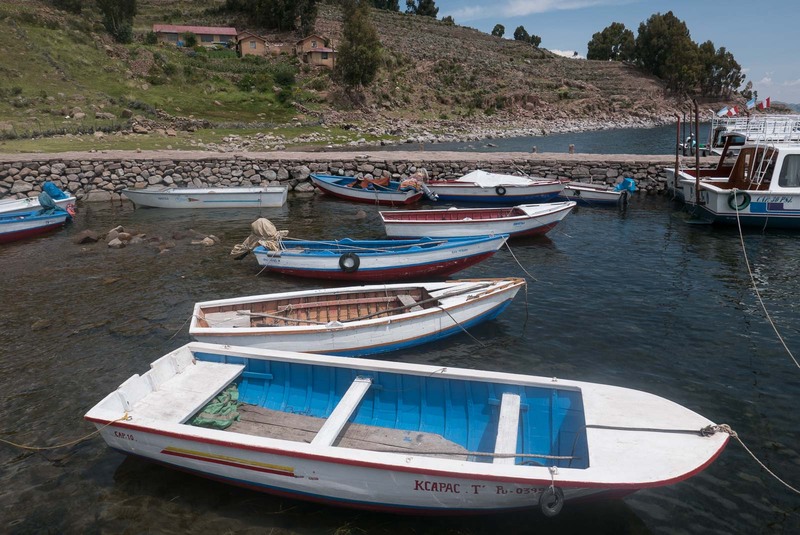 Lake Titicaca borders Peru and Bolivia. 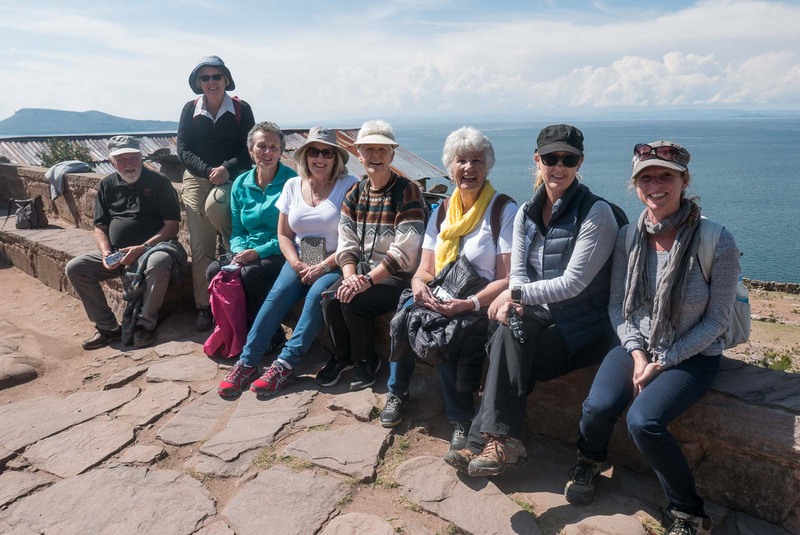 The islands we visited were on the Peruvian side of Lake Titicaca. 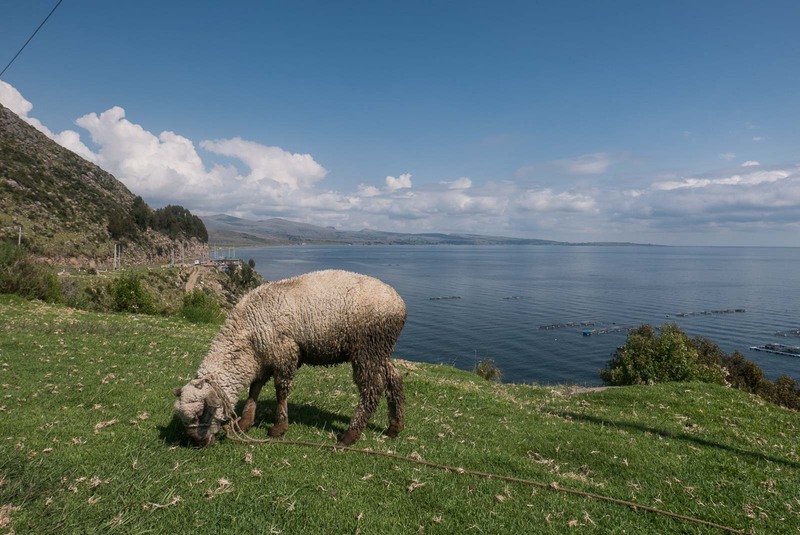 We stayed at Taypikala Lago Hotel in Puno. Was it long enough? There were more islands we could have explored but this gave us a good taste of the area. 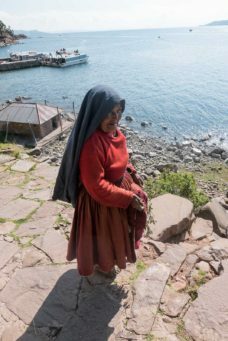 Highlights: Cruising on the lake in a reed boat, meandering down the rocky pathway on Taquile Island overlooking the crystal clear waters. 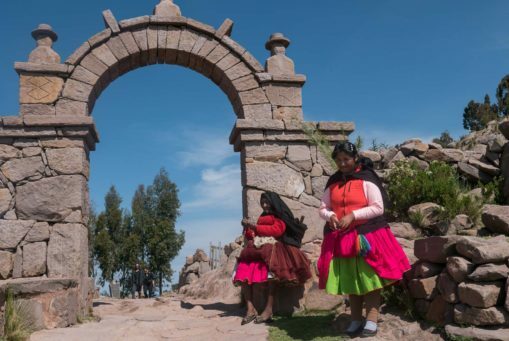 Tip: Be aware that altitude sickness is a real risk on Lake Titicaca. Join Allabroad AU on Instagram for more travel inspiration.